The great thing about bodyweight exercises is that you can do them anywhere, the biggest downside of bodyweight training is that you are limited in the amount of resistance you can use. This is why we have incorporated these exercises that only use a resistance band! They’re easy to transport and you can use them to significantly increase the resistance in your bodyweight workouts to help challenge your muscles. 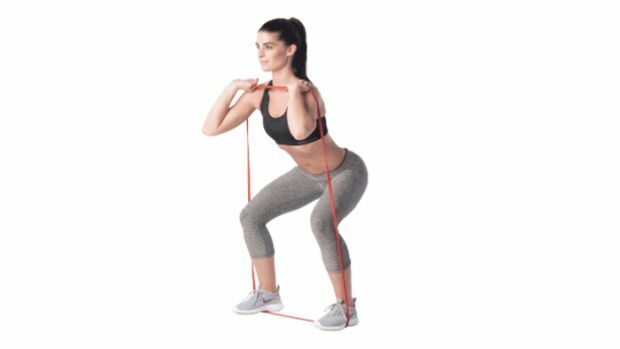 Below you’ll find a range of beginner, intermediate and advanced resistance band exercises. 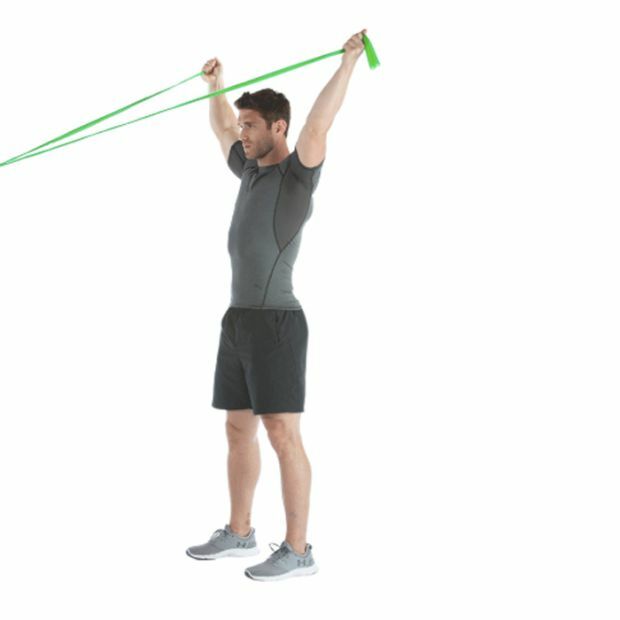 The exercises use three different types of resistance band: mini (a small looped band), max (a larger looped band, which is usually also thinner than a mini band) and flex (a strap band with two ends). You can also just get a flex band and knot it as appropriate for each exercise. Attach a max band to a stable object behind you. Step inside the band and hold it with your hands slightly wider than shoulder-width apart. Keep your shoulder blades down and back, and engage your core and glutes. Your hips and knees should be slightly bent for balance. Push the band out in front of you. Fully extend your arms and squeeze your chest muscles. Keep your chest up while performing the press and do not let your upper back hunch. 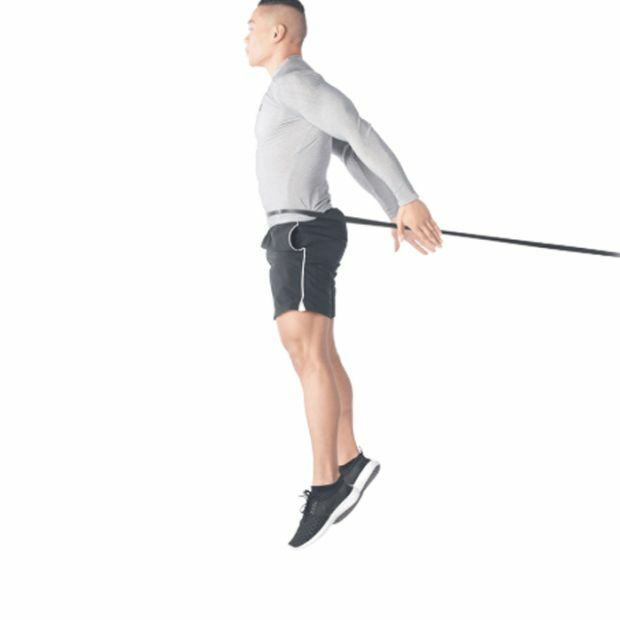 Stand on a max band with your feet shoulder-width apart. Grasp the other end of the band and hold it by your shoulders, with both hands facing up and elbows pointing out. Bend your knees to lower yourself until your thighs are parallel with the ground. Your feet should point forwards, your knees should be in line with your feet and behind your toes, and your back should be straight. 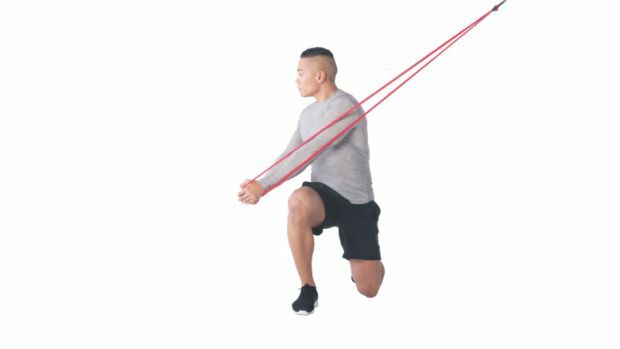 Keep pushing your knees out as far as possible – don’t let the band pull them inwards. If you cannot keep your knees out enough, only lower yourself halfway down into the squat. Lie on your back with a mini band around your feet and your knees bent. Put your hands next to your head with your elbows pointing out to the sides. Press your lower back into the floor and lift your upper body, simultaneously pulling one leg towards your chest. Keep your elbows facing outwards and make sure your neck is in line with your spine. Do not curl your chin towards your chest. Alternate legs with each rep.
Place a max band around your upper back and hold the ends in your hands. Assume a press-up position, with your hands a little wider than shoulder-width apart. Lower your body until you are touching the floor with the tip of your nose, then push yourself back up. Keep your core and glutes activated throughout, and pull your shoulders down and away from your ears. 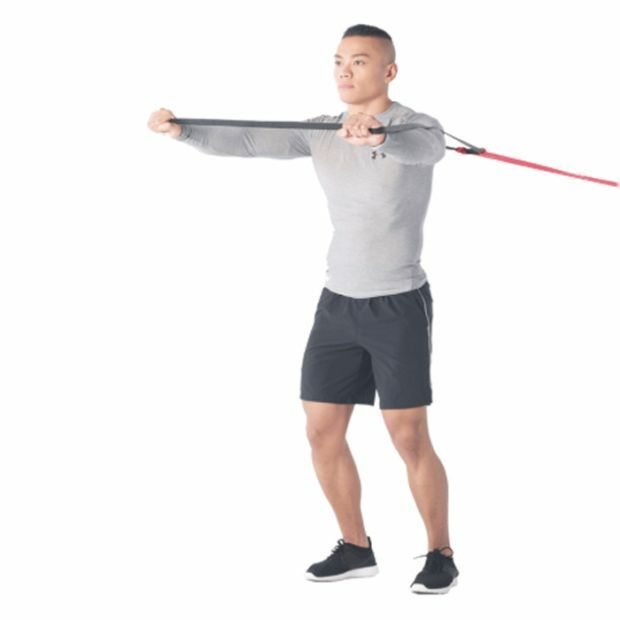 For less resistance, step through the band first so that only one, rather than both, lengths of the band go around your back. 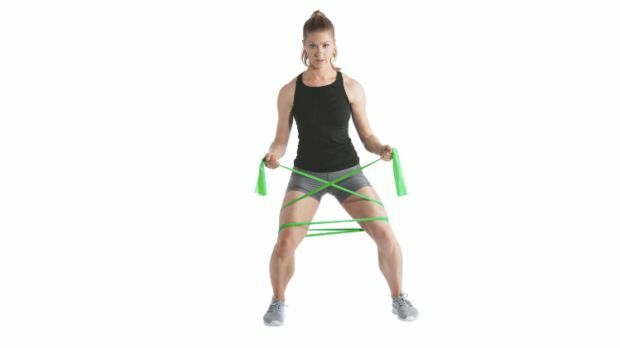 Wrap a flex band twice around your legs – once around your lower thigh just above your knee and once again around the mid thigh. Then cross the band over and hold each end outside your hips. Take ten to 12 steps to one side, then reverse the direction of the steps to the start. Don’t let your knees rotate inwards. Keep your toes facing forwards and your back straight throughout. Attach one end of a max band to a stationary object above your head. Stand side-on to the band and put the knee closest to the band on the ground. Hold the band in both hands and bring it to your opposite hip in a chopping motion, turning your trunk away from the attachment. Attach a flex band to a fixed point in front of you. Stand tall with your arms extended in a Y position, holding the ends of the band in each hand. Pull your shoulder blades down and back and engage your core and glutes. Lower into a squat, maintaining the shoulder and arm position. Avoid lifting your shoulders, bending your elbows, and arching or rounding your back. Also watch out for your knees caving in or your toes turning outwards. Place the band around your hips and get into a squat position. Jump forwards explosively, driving your hips forwards, then land softly. Attach a flex band to a stable object. 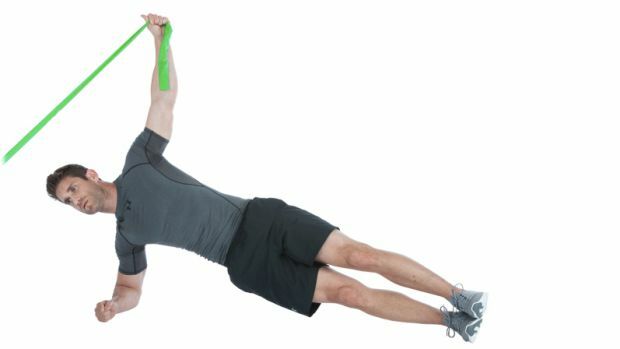 Grasp the other end of the band and get into a side plank position with the band taut. Keep your hips high off the ground, your spine neutral and your core braced. 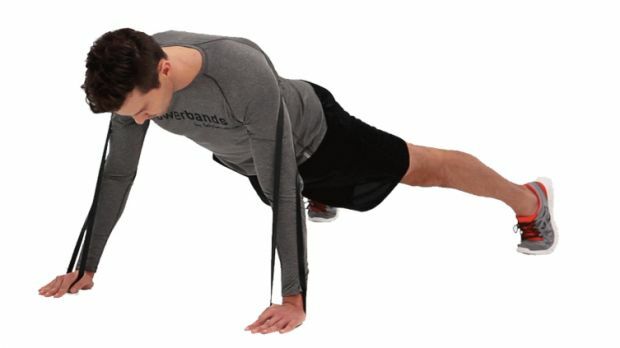 Maintain the side plank position while pulling the band towards you until your hand is above you and forms a straight line to the elbow supporting you. Don’t let the weight rotate your pelvis and torso forwards.